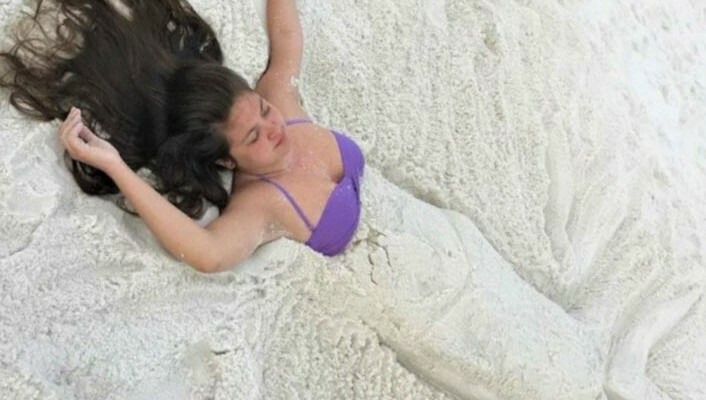 Why does the Emerald Coast has such amazing, SUGAR WHITE SAND? A beach is a beach, right? Is that what you believe? Not along the Emerald Coast. No matter where you go along this stretch of the panhandle, the sand will look amazingly white, like snow or sugar! Yes, that’s right! Not dark, not even orange, but powdery, squeaky-clean white! Just drag your heels or shuffle your feet, and you will actually HEAR it squeak. It’s rejuvenating. Try to resist. There are many different types of beach sand in the world and not all of them are white. There have been many “contests” or comparisons written over the years concerning which beach has the whitest sand. 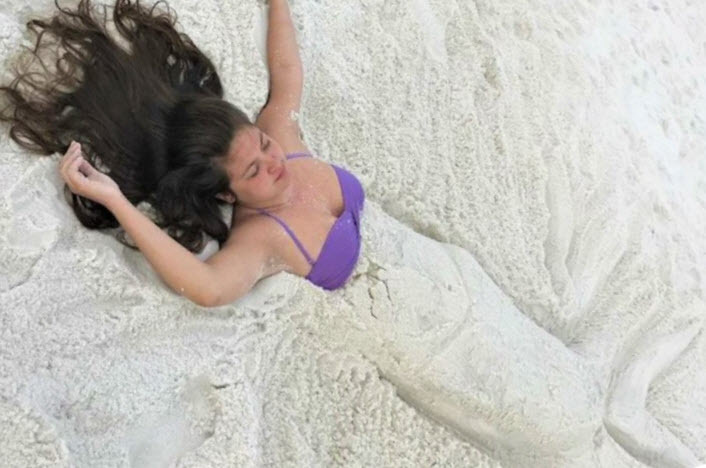 We are proud to say that the Emerald Coast has some of the purest, whitest sand anywhere in the world. 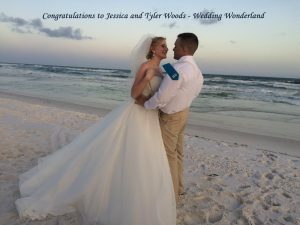 You may be surprised to learn that we actually have the Appalachian Mountains to thank for the beautiful snow-white beaches here along the Emerald Coast. Yes, the Appalachian Mountains! The Appalachicola River transports tiny quartz particles down to the Emerald Coast and deposits them here for us to enjoy. Therefore, it would be wrong to say one beach is like another. Here’s why. A very long time ago, as global temperatures began to rise, and the ice caps began melting, large volumes of water flowed to the world’s oceans. As a result, the Appalachicola River, which is formed at the Georgia/Florida border, carried water to the Gulf of Mexico. The headwaters are some 500 miles away in north Georgia. This water containing the quartz particles was washed down from the rock that forms the Appalachian Mountains. This range dominates the Eastern United States and extends through 13 states. As the sea level began to rise, these quartz sands eventually formed a new shoreline. This is the same shoreline that attracts hundreds of thousands of visitors each year to Destin Florida. As these visitors flock to the beach, you may find it challenging to find your family’s own quiet slice of beach paradise. Our Destin beach house rental comes with a very rare slice of private beach right in the heart of Destin Florida. Along the journey, these tiny quartz particles become weathered into almost perfect granular ovals. This polished shape contributes to the “squeaks” you notice when walking in our sand. That’s another reason why the Emerald Coast is rated as having some of the finest beaches in the world. The sand not only looks different, but it actually feels different under your feet. You’ll hear: “Squeak, squeak…” under your feet with every step you take. The sand feels like cool, powdered sugar between your toes! You can dig your feet into it or scoop it up with your hands and marvel at the white purity. Only a few tiny flecks of dark minerals are visible to the eye. There’s a miniature world right there in the tiny grains of sand, a world that is so small we hardly take notice. 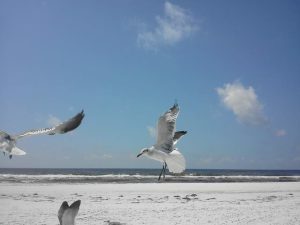 We have to tell you that because Emerald Coast locals have spent countless hours on the beautiful beaches they may take the sugar white sands a bit for granted. But during your Destin beach house rental you will agree that it is gorgeous, breathtaking, and perfect! These beaches are a steal. If you want to experience the best beach with the whitest sand in the world, Emerald Coast is the perfect place! During your vacation beach house rental at Doctors Orders, you can check it out yourself. Doctors Orders beach house vacation rental is just one block from the sugar white sands of Crystal Beach. The clear waters of the Emerald Coast will leave you awe struck. During the season the water is warm and Crystal Beach is shallow enough to walk out for quite a distance. See the live cam feed of Crystal Beach Florida from the Crab Trap Destin, just a few hundred feet from our private beach access. You will be amazed when you look down through water so clear you can see your feet on the bottom with fish swimming around your ankles. You may even want to take your family out in a kayak to enjoy the calm crystal clear water and look down on the fish, jellies, or perhaps a dolphin! Our vacation beach house rental comes with some of the best amenities around, including bikes, and yes even a Kayak. 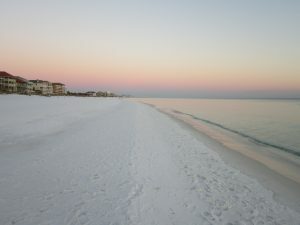 The white sands of the shore are so pristine you will enjoy walking in it. Therefore, this beach house vacation rental in Destin Florida is an incredible find! Sea creatures are all around to amuse the observant eye. Of course the prime reason most people come here is to enjoy the warmth beneath their toes, and feel the sun on their skin. However, if you’re staying right by the beach, you must take in a walk with friends and loved ones during sunrise. For some this becomes their morning ritual, strolling along the beach before anyone else adds his or her footprints. Watch the seabirds, including herons, seagulls, plovers, willets, pelicans, sandpipers, snowy egrets, and maybe even a fish eagle. See how many you can spot during your morning stroll. After your day in the sun, you’ll probably agree that this tranquility is just what the Doctor Ordered! Since you’re in no hurry to get back to your beach house rental, be sure to stay through dusk. Just when you thought the sights of the day were better than you’ve seen in years, look up! You’ll enjoy watching as the gorgeous sunset begins to develop on Crystal Beach with nothing to obscure your view for miles. Sunsets are an ever-changing delight, and in one brief evening you may take dozens of beautiful pictures to save and share. 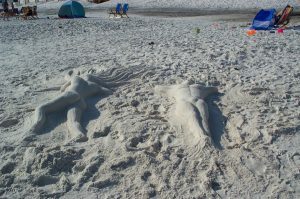 Your pictures may entice friends and family to start planning their own Destin Florida beach house rental. Perhaps you can even leave the children at the beach house for an evening, as the two of you enjoy a romantic sunset walk along the beach! Don’t miss out on the full experience of Destin. There’s many memories to be had in Destin after the sun sets. Be sure to enjoy a night or two out listening to live music while you eat. You can find a nice list of places that have live music with a map showing where they are compared to your Destin beach house rental in our Blog article about the Destin night life. Why is the water so clear in Destin Florida? The reason is really twofold: first, and foremost, the narrowest continental shelf in the Gulf is just off of Destin. Here an underwater feature called the DeSoto Canyon extends inward from deep offshore water toward Destin. This is easily seen on any map that shows underwater bathymetry, or seafloor mapping. The part of the canyon closest to shore is a famous fishing spot well known to charter boat captains. This is where one of the deeper channels extends toward shore. This channel acts to “funnel” clear offshore water in toward the Destin Florida shoreline. Second, the current system in the northern Gulf of Mexico moves in a counter-clockwise direction. So the tremendous volume of murky water coming from the Mississippi River flows toward Texas and away from Destin. They say, “it’s a treat to beat your feet in the Mississippi mud”, but you probably don’t want that mud on your feet at the beach, do you? Destin Florida definitely has the clearest water on the U.S. coast of the Gulf of Mexico. No large, sediment-rich river waters directly influence the Gulf of Mexico along the beaches of Destin, Ft. Walton, and Panama City. 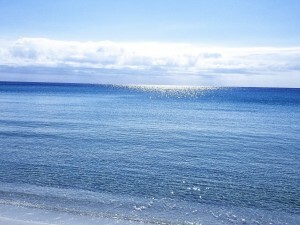 For this reason you can count on beautiful clear water just about any day of the year during your beach house rental. There is a special aqua green color, no doubt the prime reason this is called the Emerald Coast, and the water really is crystal clear. Here’s a little panoramic that shows it perfectly that I posted on our Facebook site. Some will say that the water is clearer in many tropical locations, mostly in the popular dive spots far removed from any continental runoff. If you want to go scuba diving there are many Caribbean islands that might attract your attention. They also don’t usually have to be concerned with the occasional June grass or Sargasso weeds the tides may bring in. But right on the beach you won’t find anything nicer than right here in Destin Florida.